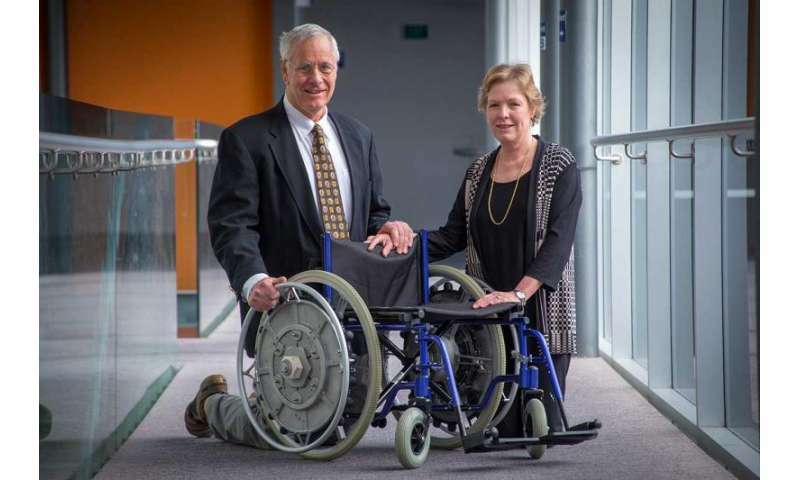 A new wheelchair prototype with an innovative propulsion system has been developed by Massey University engineers that attempts to minimise chronic shoulder and wrist problems for self-propelled wheelchair users, while making it easier for users to travel uphill. The chair, named Ezy-wheels, employs an innovative propulsion method where the user pushes and pulls the chair forward without their hands ever having to leave the pushrim. Dr Claire Flemmer of the School of Engineering and Advanced Technology says conventional manual wheelchairs have not changed in their essential design in over one hundred years and studies have shown that many people develop upper limb pain within a year of use. "Manual wheelchairs require an inefficient push effort, where the user grips either the wheel or a slightly smaller rim on the outside, called the pushrim, and propels the chair forward by pushing the rim, until they are forced let go and repeat the action. This means only about 25 per cent of the action actually contributes to the chair going forward." "This method causes an imbalanced repetitive strain on the shoulders and wrists that can lead to chronic pain—the longer a person uses the manual wheelchair, the worse it gets until they have to change to a powered wheelchair. "The new system is able to improve upon the stroke efficiency by keeping the hands on the push rim and utilising 100 per cent of the arm movement. Dr Flemmer says this will reduce the impact on the shoulders and wrists and delay or prevent pain as the load on the joints is now balanced. This new system is employed in one of the chair's two modes, called Run mode. Run mode is designed for use on longer journeys and more challenging terrain. It also employs the second innovation, a three-gear system. "The gearing system is similar to a bicycle. High gear is used when the path is easy, such as a flat or downward sloping, smooth surface and low gear when the path is harder, such as up a ramp or tarred path. Run mode does not allow the user to reverse, preventing the user from rolling backwards down a slope. "A standard chair performs poorly on even a mild upward slope and when you add age and physical ability into the mix it can be a real challenge," says Dr Flemmer. 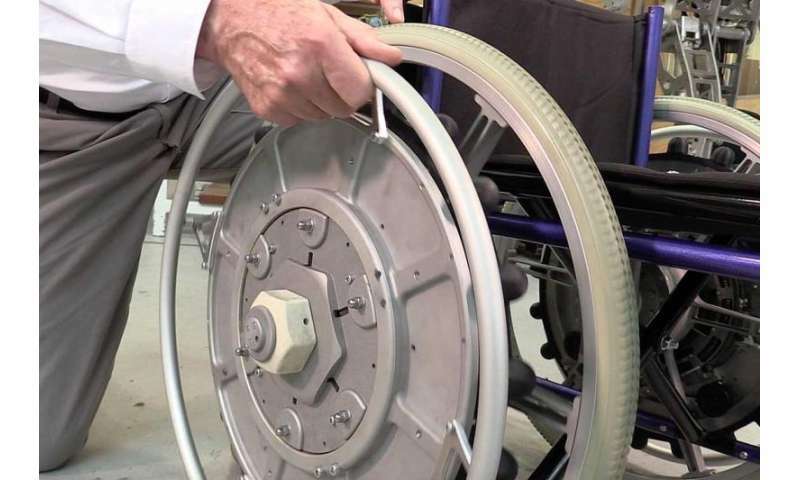 In standard mode, the chair operates just like any other manual wheelchair, allowing indoor manoeuvrability, but with the addition of three gears. Dr Flemmer's husband, Dr Rory Flemmer has collaborated on the project with her from the outset. "It all started around 30 years ago when Rory and I were watching a lady struggle to get up a wheelchair ramp because of the slope. We spent many years barking up the wrong tree with other ideas to make four-wheel drive type chairs, but I think we have it now." "This work is so important when you look at it from the point of view of someone in a wheelchair. When movement causes you pain over long distances, your world shrinks to how far you can go and if you are able to drive or have someone drive you. It's not just the physical pain as it reduces social interaction, which can lead to depression, anxiety and poorer quality of life." The chair is still a prototype but the Dr Flemmer says that plans have already been drawn up to use lighter materials to make the chair more user friendly for the final production model. A great start. Perhaps a CVT system which constantly and automatically changes down 'gear' as more force/resistance is applied to the rim should be a future aim. Is it built in to the wheel so those can be removed for compact transport ?? Fantastically innovative engineering. I am very impressed with the novelty and simplicity of this idea. The world needs more engineers who think "around the box" like this. So if pushing and pulling the pushrim propel you forward, how do you turn or stop?, and if your hands dont have to leave the pushrim then why do you need a pushrim, wouldn't a lever be more ergonomic and less bulky? It looks like weight and added technology are added to a wheelchair where weight is of primary importance to a wheelchair user (added weight WILL NOT provide a solution to users shoulder and wrist problems) and simplicity is required for users to maintain the wheelchair themselves. The wrist is still having to rotate laterally while the fingers are gripping a small pushrim, a simpler solution would be to increase the cross section diameter of the pushrim to reduce the grip and allow easier wrist articulation movement. Using gears to reduce the effort to mitigate shoulder problems is the wrong way to approach this, shoulder problems can be reduced by positional movement, e.g. repositioning the forearms. Interesting ergonimic proposal but not a solution.